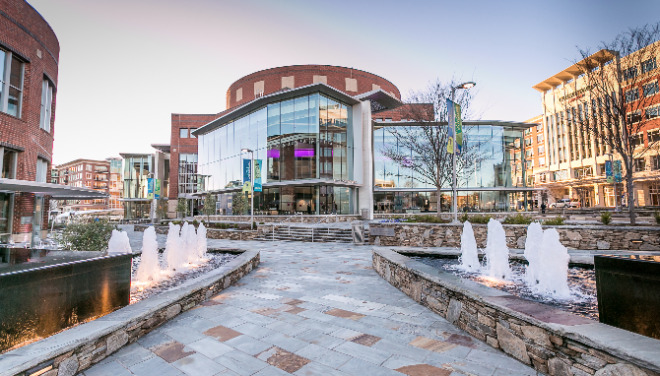 The Peace Center for the Performing Arts has become a zero waste to landfill building and is believed to be the first performing arts center in the country to do so. The Peace Center has partnered with Wasteco, Inc. for the initiative, which uses the process of gasification to convert waste to energy. All waste from the Peace Center is taken directly to VLS Recovery Services or Greenpointe Recycling Center. Once there, the material is sorted for recyclable material. The unsalvageable material is shredded and taken to a gasification site. The material is then fed into a gasifier, where the waste and oxygen create synthesis gas (syngas). This syngas can then be cleaned for any impurities and used for energy. Each year, Americans generate 250 million tons of municipal solid waste. Per day, that equals about 4.3 pounds per person. This includes trash such as kitchen waste, electronics, light bulbs, plastics, used tires, old paint and yard waste. Despite significant increases in recycling and energy recovery, only about one-third of the total waste is generally recovered – leaving the remaining two-thirds to be disposed of in landfills or incinerated. Methods like gasification are changing that. There are significant environmental benefits of gasification, including reducing the need for landfill space, decreasing methane emissions from the decomposition of organic materials in the landfill and reducing the risk of groundwater contamination from landfills. The zero waste initiative is in place across the entire Peace Center campus, including the theaters, administrative and production offices, and theater lounge Genevieve’s. The Peace Center for the Performing Arts is located at 300 S. Main Street in downtown Greenville, S.C.